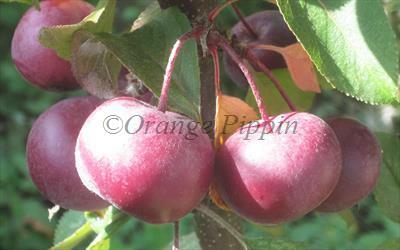 Laura is a modern dwarf crabapple variety with large persistent fruitlets which are good for making crab-apple jelly. The blossom is dusky pink, and the young leaves are bronze, turning green later. Please fill in the details below and we will let you know when Malus Laura crab apple trees are back in stock. 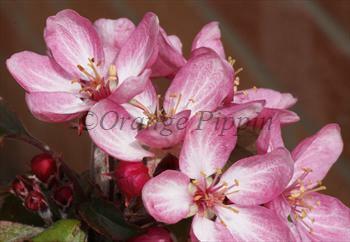 Malus Laura is in flowering group 2. Malus Laura is self-fertile and does not need a pollination partner, although fruiting may be improved if there is a compatible tree of a different variety nearby. Note that Laura is a naturally dwarf crab apple variety and the mature height will usually be smaller than the dimensions advertised in our ordering section. Typical yield in good conditions from a mature tree will be around 2kg of crab apples. Laura was developed in the UK by Hugh Ermen, who also raised a number of successful garden apple varieties such as Scrumptious.